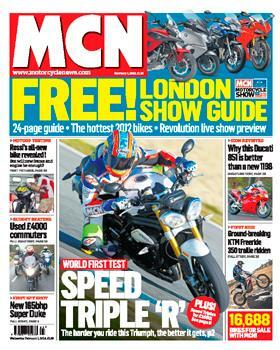 In this week's issue of MCN, on sale Wednesday February 1, we test the new Triumph Speed Triple R at Jerez. The 'R' version costs £2500 more than the standard version, and for that you get Ohlins suspension, Brembo brakes and lightweight forged wheels. But is it worth the extra cash? Also in this week's MCN we reveal KTM's new 1290cc Super Duke, spotted during testing in Tenerife. 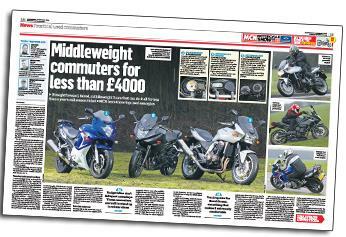 Plus, we ride the KTM Freeride 350, £4000 commuters tested and Michael Rutter reveals who he will ride for in 2012. Triumph has added a dynamic new dimension to the hugely popular Speed Triple by giving it the 'R' treatment. 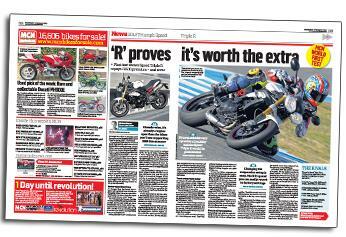 MCN tested the Ohlins and Brembo-shod bike at the launch at Jerez. KTM's all-new 1290cc V-twin Super Duke has been spotted strapped onto a trailer in Tenerife as the prototype machine undergoes endurance testing before its launch later this year. Straightforward, faired, middleweight fours that can do it all for less than a year's rail season ticket. We test the top three used examples. 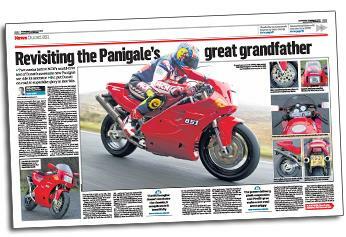 With MCN's world-first test of the ground-breaking Ducati Panigale superbike only two weeks away, now's a good time to get a taste of a bike that was just as pivotal for the Italian factory. The 851. 2012 marks a new era for the Kawasaki Racing team. For the past three years the factory project has been operated by the British Paul Bird Motorsport squad but for the coming season it's all change with the Spanish Provec team taking over the running of Kawasaki's number one racing effort. The first time Colin Edwards approached turn 11 at the Sepang circuit for the 2012 test, he did so trying to control a tidal wave of emotions.